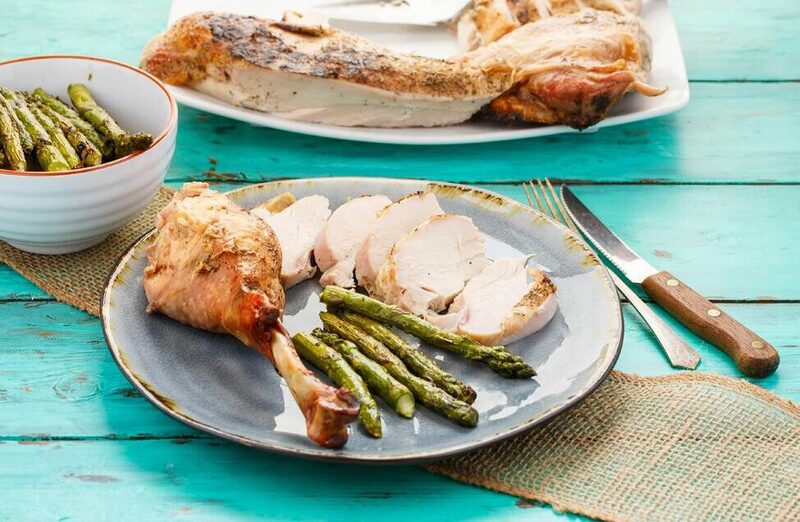 Brine: I used Canadian Turkey's brine for this recipe, adding in a jalapeno, onion, carrot, sliced grapefruit and a whole head of garlic with some fresh thyme leaves! You can get creative! 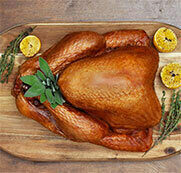 Once your turkey has thawed, place turkey, breast side down, on a cutting board. Remove back bone with poultry shears and cut through ribs (you can also have a butcher do this.) Turkey should be able to spread open (we have now butterflied it.) Turn turkey, breast side up, and using good force, push hard down on the turkey breast. You should have the legs and wings pushing out sideways (like the bird has been flattened.) You will hear cracks and notice that the turkey is flatter. Cut off excess skin to reduce flair-ups while on the grill! Remove turkey from brine, move to a baking sheet or pan with wings tucked underneath, and pat dry. Allow turkey to sit, uncovered, in refrigerator overnight. On the day of grilling, remove turkey from refrigerator. Season with pepper, garlic, thyme, and paprika. Heat the two side burners of your grill to medium-high heat and leave the middle burner off. Place drip pan underneath the grill where the burner is set to off. Oil grill to prevent sticking. Once temperature is staying steady between 375° F - 400° F, turn down two burners to medium heat. It is okay if you are a bit above these temperatures as opening the grill to put the turkey on will let out heat. Place turkey, breast side up, over the drip pan. Wings and legs should spread over to the sides where the heat is coming from. Move turkey to a baking sheet and cover with aluminum foil and allow to rest for at least 20 minutes. Notes: Get creative with the brine and seasonings! Butter under the skin with fresh herbs is always pleasing. Turkey may take more or less cook-time depending on how consistent your heat stays. Use a meat thermometer to ensure proper internal temperature (dark meat 175° F)!